A file descriptor (Unix, Linux) or a file handle (Windows) is the connection id (generally to a file) from the Operating system in order to perform IO operations (Input/Ouput of Bytes). For Wikipedia, a file descriptor is an index for an entry in a kernel-resident data structure containing the details of all open files. In POSIX, this data structure is called a file descriptor table, and each process has its own file descriptor table. The user application passes the abstract key to the kernel through a system call, and the kernel will access the file on behalf of the application, based on the key. 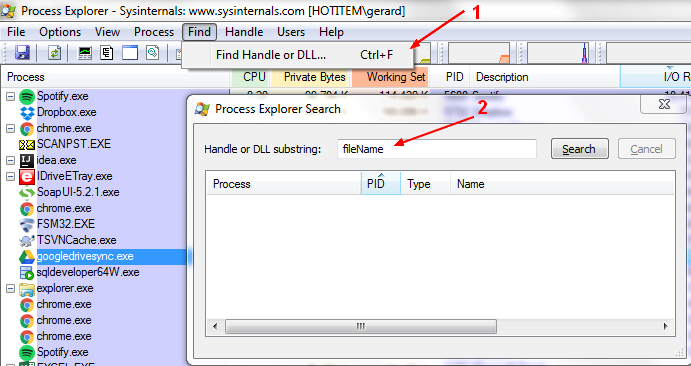 The application itself cannot read or write the file descriptor table directly. or another source or sink of bytes. FIFOs (also called named pipes), IO - Standard streams (stdin, stdout, stderr) ? A file descriptor is a low positive integer. There is a limit to the amount of file descriptors per process. # example : the ``-f -- /'' arguments direct lsof to search for open files with a `/' path name, all open files in the `/' (root) file system. bash    3802 root  cwd    DIR    8,3     4096    2 .
lsof    7811 root  cwd    DIR    8,3     4096    2 .
lsof    7812 root  cwd    DIR    8,3     4096    2 .